Cory Dale, a.k.a. Karen Duvall, has released her latest book: an urban fantasy set in a version of New York that blends demons, steampunk-style tech, ghosts, and witches. It sounds like great fun, and today she’s got an excerpt to from the book to share with you that lays down some clear goals for her demon protagonist Henry Paine. Check it out! “Your neighbors don’t seem to like you very much.” The woman hadn’t stopped smiling. The word “neighbors” sounded like “naybehs.” A Southern girl. Henry sighed and backed his way into the apartment, sweeping out his hand to welcome her in. “Thank you,” she said and stepped inside. The woman had guts, he gave her that, but he questioned her intelligence. He outweighed her by a good hundred pounds, though that hadn’t stopped her last night. The bruise on the back of his head was gone, but not the memory of how it got there. She obviously wanted something else from him and he was curious to know what it was. “I’d offer you coffee, but I’m fresh out,” he lied, inhaling the luscious scent of his morning brew. The robotic arm on the fridge unfurled from its side, two eggs clutched in its steel-clawed hand. It angled as if to throw them straight at the woman’s head. Wanda stared down at his copper heater and it scuttled underneath the bed. It was scared of her. Why? 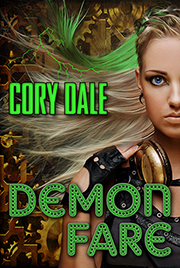 He didn’t know anything about this woman, but his demon intuition told him she was dangerous. She was up to something, and it had to do with the demons she’d stolen. He locked eyes with her, his will funneling through him like water through a rain spout. He poured it directly into Wanda. A thin line of blood trailed from one of Wanda’s nostrils. That wasn’t good. She had to stop resisting him. It was vital she tell him where his Vox were. Those boxes held the future. They represented progress for the modern world. And most of all, they were tied to his family’s livelihood. Wanda launched herself at him and he caught her by the elbows. Her right hand pressed against his chest, fingers splayed over his heart. “Stop,” she whispered. There was a tugging sensation beneath his skin, then beneath his rib cage. His heart pounded, the muscle cramping and then opening, as if to release something from inside. Part of him felt compelled to return to the Earth’s center and the molten core where the source of his being still lived. It hungered for half of him, his demon half, pulling at one part of his soul while the other part clutched desperately at his humanity. They stood locked together in a stalemate of power. If he didn’t release her, she’d die. If she didn’t release him, his demon half would leave him forever. And he’d surely die without it.